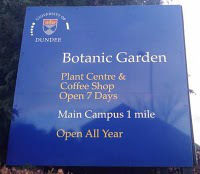 This Sunday – 4th November – the Friends of the University of Dundee Botanic Garden have an event at the garden. Christopher Dingwall, Landscape Historian and Heritage Consultant will talk about “James Thomson and the Garden City Movement in Dundee”. Thomson was a visionary City Architect around the turn of the 20th century, whose legacy is still evident today, though many of his ideas were halted by the First World War. All welcome – the event takes place at the garden’s Education Centre at 2pm.